Yoi develops sales reps faster increasing their speed to quota by 50%. Yoi engages new hires from day 1, ensuring a great first year experience and reducing attrition by 76%. Yoi provides continuous assessments, and directs employees to the resources necessary to maintain optimal engagement. 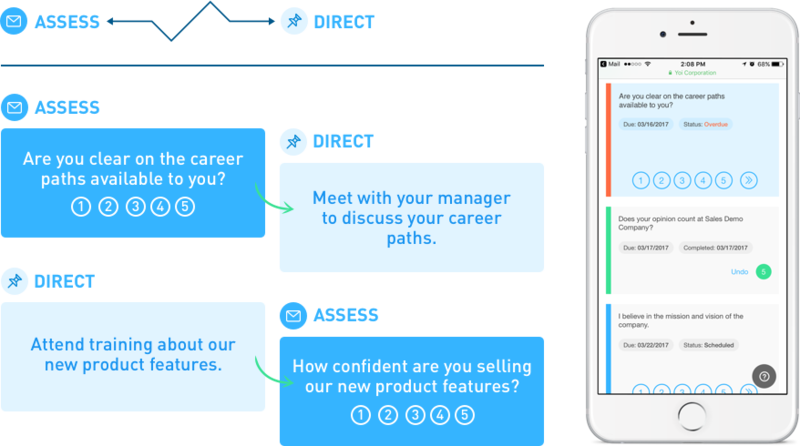 Yoi's assess and direct engine allows organizations to accurately track the progress of their new hires. If a team member is slipping off track, Yoi suggests the necessary prescriptive actions to take, offering the right support and guidance just when it's needed the most. Whether offering coaching for a critical conversation or the opportunity for continuous 360 degree feedback, Yoi makes sure new hires and managers are set up for success every step of the way. "Yoi is the first system that actually tracks the behaviors that matter." Receive the resources, support, and guidance they need to reach and stay at full productivity. Receive the support and guidance they need and have one place to manage their employees’ development. Yoi alerts them when their employees need help and gives guidance on how to engage. Receive visibility and insight into the organization to see who’s at risk and how to get them back. Receive real-time insights and unparalleled visibility, so they can know which reps are at risk and which are on track.